Willem Van Cotthem has a solution for everyone who has ever wanted to garden but thought he or she did not have the space. 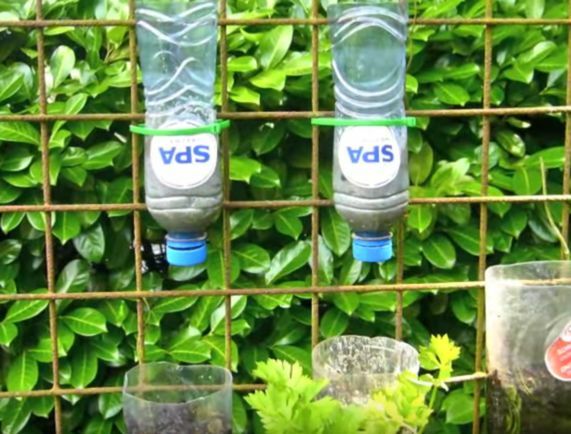 His bottle tower method is an efficient and sustainable way to grow vegetables and herbs while also recycling plastic bottles. Van Cotthem, an honorary professor of botany at the University of Ghent in Belgium, made a YouTube video to demonstrate how the inexpensive method can be adapted to fit the needs of any space and the wishes of any grower. 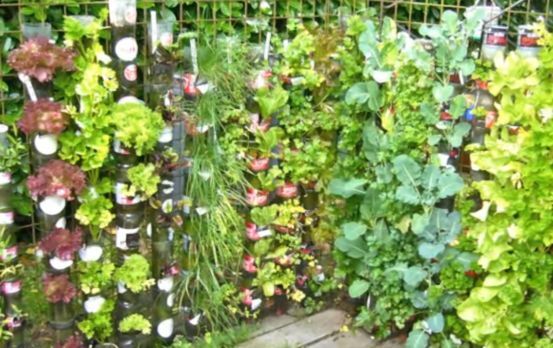 To construct Van Cotthem's bottle tower garden, you need recyclable containers such as plastic bottles, pots, and buckets. Begin by cutting the bottom part of the first bottle. Leave the lid screwed on the top. Next, use scissors or another sharp object to perforate the wall of the bottle, 2 to 4 inches from the top of the lid. To make a drainage hole, cut diagonally across the bottle. The purpose of these holes is to allow surplus water to drain out of the container. Fill 1 to 2 inches of the bottle with potting soil. Congratulations! You've built the base of your tower. Remove the lids from the next three bottles. Cut their bases and fill with potting soil. Now stack all four bottles, using simple wires to keep the tower standing. 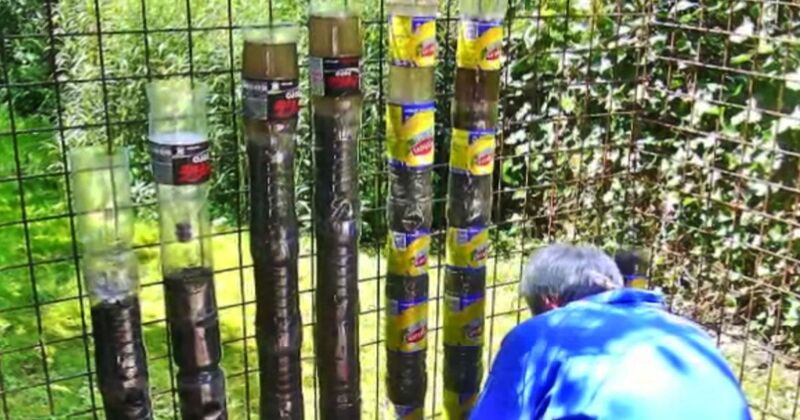 When you are satisfied with the height of your tower, push the bottleneck of a bottle without a lid into the soil of the top bottle. This will be your funnel. A final bottle topping the funnel will act as a water tank. In this final bottle, make a very small hole in the lid. It is best to use a drill to make a 1 mm opening, through which water can slowly run. This is effective because water gradually runs from the water tank into the funnel, moving slowly through the entire tower and moistening the soil. Once your tower is constructed, it's time to plant your seeds. Using a sharp knife, cut a small, three-sided "window" into the bottles below the funnel and water tank. With your finger, push into the soil creating a vacant space where seedlings can be planted. Before you know it, new roots will form, young plants will grow, and you'll have fresh tomatoes, bell peppers and rosemary with every meal! Van Cotthem shares his extreme success in his YouTube video, demonstrating his homegrown herbs including rosemary, parsley, celeriac, chives, garden sage, basil and stevia. The range of vegetables Van Cotthem has grown is equally as diverse. His bottles grow celery, tomatoes, bell peppers, cauliflower, broccoli, sweet fennel, beets, and several varieties of lettuce, including red and green chicory, red curly, escarole, and endives. 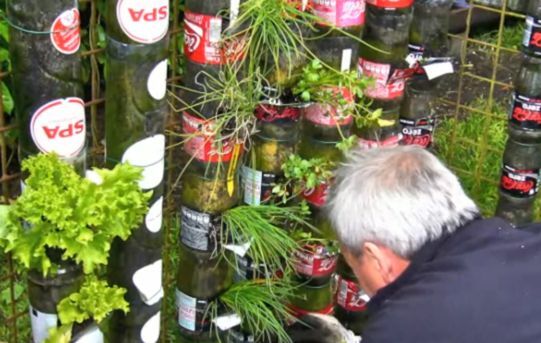 According to the Mother Nature Network, vertical gardens such as the bottle tower method make gardening accessible to a range of people who may otherwise not grow their own food. Limited yard space, poor quality soil, pest invasion, weed growth, urban living, and conditions such as arthritis or fibromyalgia no longer have to be barriers to gardening.